my new best girl betty arrived in the mail on thursday. she is a welcome addition to the little room. i knew i would name her when she got here, and as i took her out of the huge "i could make a fort out of this" box, she named herself as i heard "betty" whisper in the air. she is wearing an apron i found yesterday at a delightful antique mall in port townsend. 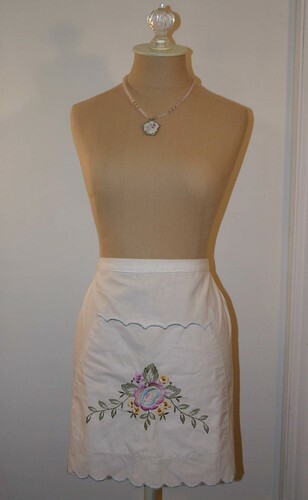 it looks like someone took a tablecloth or table runner and created an apron from it. love how the person used the embroidery for a pocket. in this next photo, she is wearing an apron my mother and i made together last summer. hard to believe that i was so overwhelmed by the thought of trying to understand how to use my sewing machine a year ago after a 20 year absence from sewing (yes, that means i was about 10 when i was sewing before this last year). 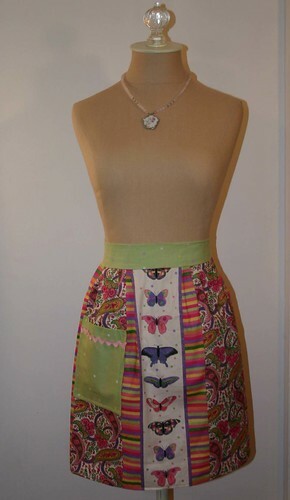 i love this apron for many reasons...the colors...the butterflies...but mostly i love it because my mom and i made it together.